So Zambia is poised to have the 2016 Presidential and Parliamentary general elections under the newly amended constitution. Fantastic. I am excited due to some progressive clauses in there, of note is the dual citizenship. Our friends and relatives in the diaspora will surely have something to giggle about over this one. They have been awaiting this one for ages. Now their kids born elsewhere on the planet can at least also claim Zambia as their home land. What a breath of fresh air them parents must be breathing. The ceremony came and went. History was made on that 5th Day of January, 2016. Like it or not it was history and history is told by the victors. Time to move on to the implications of some of the new items that have just become part of the supreme law of the land. My own take from most of the content, and one which was a big discussion point from many constitution making processes in the past, is the 50%+1 threshold for the presidential candidate to emerge as winner in the presidential race. For my own sanity, I looked up 50% +1 vote just to be sure what it means, and now I get it: a presidential candidate must get 50% of the votes plus one more vote than the closest contender. Essentially one can have 10 and other 11 and the 11 one wins. This is also called First-Past-The-Post(FPTP). But wait , wasn’t that what we had before? Of course but we now have the advanced version of the same. Now, lets us first get rid of the confusion that might come up. Some people use terms such as majority vote, highest vote and plurality voting systems. These three all use the First-Past-The-Post voting method with some minor tweaks in the execution of the method. The two-round voting system uses the FPTP voting method in each of the two rounds. Round one determines which two candidates will progress to the second and final round of voting. Part 1 of this four part series will focus on the 2001 elections. I will guide you through some of my thoughts and you can give me some of yours and we get talking about this very important political change for our country. Our politics have changed for ever with this new clause of 50% +1 vote. I will examine the performance of the political parties in Zambia today and in the past. I will pick the top 4 in each of the elections that took place during the past 15 years. That information will form the basis for the discussion as to how the 50% +1 would have worked out for each of those years, starting with 2001. By the end of part 4 of my articles, I will give you my opinion on the most likely outcome of the 2016 elections and also give you a chance to do the same. If you are on telegram (whatsapp competitor), we can discuss your thoughts there. The link is 50%+1 telegram discussion. To do this write-up some justice and to make the reader follow my rumblings, I went into the archives of previous presidential elections in Zambia. While doing the searching, I noticed that apart from the 1991 and 1996 presidential elections, all the post multi-party democracy elections have never produced a winner in the first round of voting that would qualify for the absolute majority under a two-round system. It also means, we have had no way of knowing how differently people would have behaved given a second chance to pick from the top two candidates, until now that is as I show you how. One thing is for sure though, the 1991 elections were the only multiparty elections in this country that had almost zero regional or tribal voting as we would like to call it. If you check the 1991 voting figures, you will be my disciple on this one. I will use 1991 as the baseline vote and accord it Grade 0 Tribal Voting Index (0 being the lowest tribal index and 10 the highest), TVI hence forth. This is my index and its use is based on my perception of the results distribution compared to 1991. I will show you in later articles, that the 50% +1 that has now become law is a very cunning way for the PF party to try and beat the UPND at their own regional voting style while enhancing their own hold on areas where they do very well with regional votes, such as Luapula province. Before the UPND supporters reading this try and go for my chin, just hold on a bit and see where I am going and also just check the elections results below. You know the old saying about numbers. What the PF is doing is called reverse action or in our case here reverse tribalism, regionalism or even more boldly put “Donchi Kubeba on steroids”. Going back to the figures, would the late Mr. Mazoka (MHSRIP) have been the winner had we been given a round two in 2001? Would the late President, Mr. Sata (MHSRIP) have been president earlier than 2011? Would Mr. Hichilema have benefited from a second round in 2015 or would it have awoken the absent voters and given President Lungu a bigger margin? May be, may be not. With the help of these numbers, we can try and see how voters might react, given a second chance of voting, with or without their initial candidate being among the top two. As they say, we learn from the past. Study the data below carefully. We shall use the same data throughout the series. These results are rather interesting if you look closely. 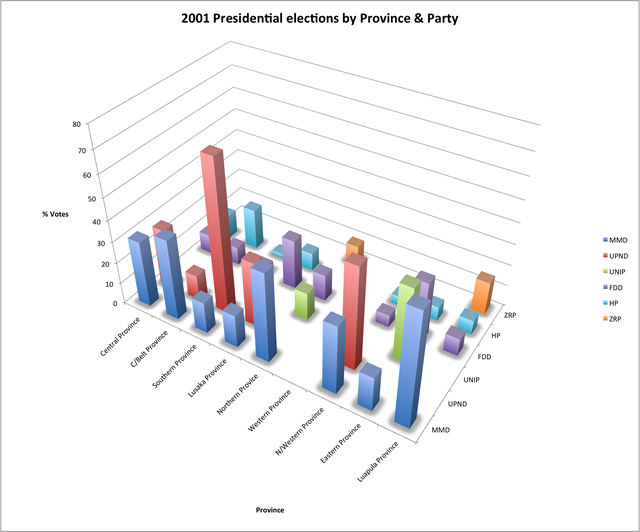 There is a lot of data to be gleaned from here but for now though I will be focusing the analysis on 2001 election numbers, the front role in the chart above. Not shown here (to reduce clatter), in 1996, of the 1,325,053 votes cast (please check the ECZ Website), the winner needed 662,000 votes to get absolute majority. Late President, Dr. F.T.J. Chiluba (MHSRIP), polled 913,000 votes. No round two would have been needed. As I indicated earlier, 1991 was the most tribal free election in Zambia and scored a TVI of 0. In 1996, a few politicians came up and thought they could also exercise their right to be elected to the highest office of the land but in my opinion, it was way too soon for Zambians to have developed an appetite high enough to get rid of the MMD. People were not really ready to change after 27 years of waiting for change and may be change just for its sake. So again, we got an election with TVI index of about 2 and still got a more than 50% +1 for President Chiluba. The TVI index here is showing us that with the introduction of more presidential candidates from various parts of the country, we started getting into a scenario of votes being distributed based on regional groupings and/or strongholds anchored on traditional relationships with past politics. Are you surprised that FDD under the late General Tembo came second in Eastern and Lusaka provinces? What did those two places have in common at that time apart from a dominant language? What about MMD and UPND in relation to the provinces where they came first and second by merely swapping positions? You will also recall that at this time, late President Mwanawasa was believed to be Bemba and he went along with that. He later had to switch and become Lenje during the 2006 elections. That tells you that my TVI theory might just hold some water after all. We will see when we get to the article about 2008 later on in the series. The Bemba card seemed to have worked somehow for President Mwanawasa in 2001. Just look at the MMD’s performance in Luapula, Northern, Central and Copperbelt provinces. Those were (and some still are) MMD so called strongholds. How possible was it that ZRP under the late Ben Mwila came out second in Luapula province and performed terribly elsewhere apart from Northen province where ZRP came out 4th. How come UPND did not even make 4th position in Eastern, Luapula and Northen provinces? The answer is that despite our burying the heads in the sand, Zambians vote by interest and rarely by issues, unless it is time for a revolution vote such as the 1991 and 2011 elections. From the numbers in the chart above, I think this earlier thought of mine is shown to hold water. Businessmen do the same when voting. Why do stocks sometimes fall when elections are near? Businesses become nervous and hope they get a candidate that will protect their interests. Why can’t a farmer in Monze do the same or a fisherman in Mpulungu? Who is better at handling the farmer’s interest, a fisherman? No way. Would a fisherman trust a farmer to understand their challenges and guard his interest, I don’t think so. Thus we shall keep getting votes that are skewed to people who form some sort of connection with the voter. That is the first instinct of every voter, like it or not. Unfortunately in Zambia, it also means region is an interest we like to keep. The numbers are there to tell us this all the time but we keep thinking and talking otherwise. The 50%+1 will have to deal with this reality. In any case, the TVI had risen to 5 in 2001, which was really the mid point for the tribal vote. We still had sensible Zambians who cross-voted and made sure everyone got a piece here and there. It would get worse though in subsequent elections as I will show you in later articles. As at 2015 elections, were were almost at TVI 8 and my assumption is that we will get to TVI level 9 this year, but I digress. In the scenario above and assuming we had the 50%+ 1 rule, would FDDs 13% and UNIP’s 10% voters now in limbo have decided to vote again or stay away? If they did decide to vote in round two, who would they have voted for? Those would have been the votes to fight for by the two top contenders, but its also the time for painkillers for the headaches to befall the stranded voter. You had hoped your candidate wins. Now they are out. What do you do? To answer this question, take a look at where FDD and UNIP votes mattered most. FDD could have had an impact in deciding who got which votes from Eastern and Lusaka provinces. Lets us face it, between them, UNIP and FDD had 63% of the vote that year in Eastern Province. UPND was not even top 4 there. So one would think that both would give the MMD their votes or just fold their arms. The loser then would be UPND who had almost nothing there in terms of votes. For FDD and UNIP, this was a very regional vote without doubt. Where else was UNIP significant? Oh, in Northern province they had 13%. Again, the round two contender, in this case UPND was not given any meaningful votes in that province and so the stranded UNIP voters would probably give their vote to the top party in that province, MMD or stay away and still contribute nothing to the UPND’s cause, thus negatively affecting their prospects in round two. FDD is also useful in Lusaka province. They came second with 24% of the votes there. Where would they place their vote? This one is interesting but my guess is that at that time Lusaka was a smaller Eastern province and I think that over 80% of the 23% FDD vote would have gone to the MMD due to the fact that UPND got almost nothing from Eastern province in that election. In the end a 50%+1 result would have enabled the MMD to still win this election after the second run, largely due to a dose of tribal voting and regional strongholds. The voting patterns would not have changed and both MMD and UPND had received regional votes in round 1. The winner of round two would have relied almost entirely on the stranded voters’ perception as to which candidate best represents their interests, whatever that may be. This result would been as I have predicted despite the fact that we still had not drifted too much into the upper scale of the TVI index. In the next article as we analyse 2006 and 2008, I will show you how the TVI moved and how some ideas of alliances being contemplated for 2016 elections can be ill-timed or entirely wrong. 2006 was interesting, a new kid on the block arrived and two candidates could not both fit in the same region and tribal grouping. Something had to give……. The title and article is divisive, LT you can do better. Please focus on articles that unite the country. I am surprised that such a wordy article completely missed the meaning of 50%+1 provision versus first – past – the – post. Is this the result of lower education standards in our schools that critical reasoning is being lost? And the whole article has such a flippant tone! I thought the graphic at the start of the article had meaning but no, it is just graffiti. 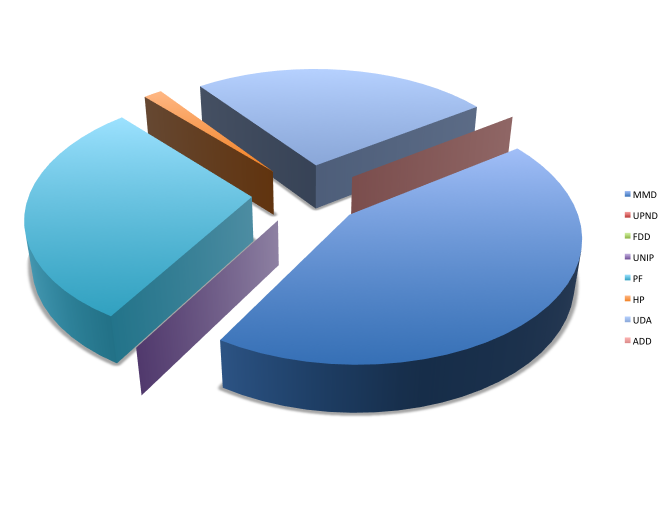 The key or legend on the side does not link to the pie chart. 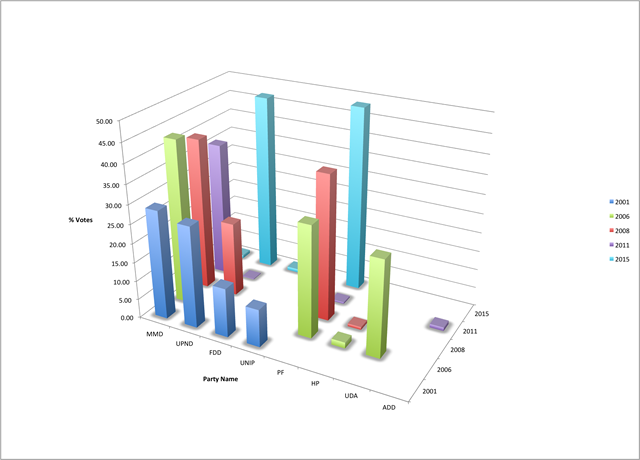 For example, the UPND colour does not even appear on the chart. Is this the perception by this Bemba crook that UPND does not count at all under the scheme of things? I think it is a masters thesis that will be shelved and never be used. I also wish when southerners, north westerners and westerners vote for the best candidates each time, it will be called interests and not tribalism. I wish at the same time the converse was also true for northerners and easterners- that when they always vote for their own as they have always done it is called tribalism and not voting for interests. This is a good article. It shows that though people accuse a certain tribe of being tribalist they themselves vote for their own.It also shows that much has to be done in educating the Zambian electorate about being more issue based in their voting pattern.Sometimes the truth hurts and Zambian needs to wake up and change their voting pattern of voting for their tribesmen who have actually wrecked the country and start voting based on who they think will assembly a team that will move Zambia forward. This article stinks of pure tribalism and promoting a notion that only Bembas can rule or decide who to rule Zambia. It ignores the fact that Zambia is bigger than a tribal grouping. 2015 elections were a clear indication that UPND has really gained momentum. If it was under the 50+1 % regime UPND would have carried the day whether rigging or no rigging. This time around, my prediction is that UPND will win over 90% of the votes in Southern, Western, North Western , Lusaka and Central provinces. These are guaranteed UPND votes. Over 90% of the MPS in these areas will be UPND no doubt about that. Then in PF strongholds UPND will only need an average of at least 30% of the votes to cross the winning threshold. However for this to happen, UPND must demand to audit the voters registers for all their strongholds to ensure all registered voters are reflected on the registers. I say so because rigging this time will not dwell much on changing the numbers during tallying, but will be done by denying voters in UPND strongholds from voting in the first place. This is Emmanuel Mwamba ‘s scheme backed by TIMOR consulting. Please UPND demand for auditing of the Voters register now before it too late for PF ECZ to give an excuse that they can print new registers or correct the mistakes. VIVA UPND AND HH TEAM. LT, we’re not interested in regional or tribal statistics, politics or whatever. We don’t want the media to divide us. Stop it baSwine! Man this 21st C, you`re still marinated in tribalism. Very great article and thats what gona happen. UPND is losing whether they like it or not. Of all the analyses I have read on this topic, this one makes a lot more sense. Or at least the author put in some effort. Of course no one expects everybody to agree on everything but, unfortunately, these days it has become so transparently obvious that the TRANSPLANTS from ZWD will never accept or even try to critically analyze anything that does not MASSAGE THEIR OVERLY INFLATED EGOS. Even when facts smacks them right in their faces. No intelligent counter-arguments other than insults and empty rhetoric—and that’s a typical “UPNDist” for you! I bet you people rubbishing the article probably didn’t even read half of it, let alone finish it. Instead you simply rushed to comments so you can insult to feel better. What a species! Very simplistic way of looking at it. Is this your research quantative or qualitative? Seems to be quantative with a completely qualitative untested and completely subjective analysis. I, for instance would be interested in some treatise on the internal and external validity of your assumptions. Without this, I think you need to abandon any further publication of your thoughts. Better still, get him a PSYCHOANALYST!! What a useless article? I think the writter can do well to get back to school. Please Ba Lusaka times, improve next time. Dont give space to worthless articles like this one. Thank You. LT specialise in such useless articles, whether by Kashiwa Bulaya or Chitimukulu. These are wordy, convoluted and meaningless rhetoric designed to put forward Bemba-first messages. It’s a good article.UPND will lose terribly in the second around if PF fails to win in 1st around.People will see how people from southern vote and will be annoyed such that it will be nega nega vs nega nega.who wins PF period.HH is retiring in 2016 weather UPND like or not.EL has done well to amend the constitution.It’s true that pipo from eastern and norhern part of Zambia feel insecure with UPND.That is real ba UPND.U’ll be again defeated for the 5th time.The problem is UPND cadres who insult other tribes n think it’s their time to rule.We need quality leadership not it’s time for us to rule Zambia. #Moscow (OP): be serious! If northerners and easterners provide quality leadership, Zambia would not be such a cess pool that it is today over 50 years after independence. Your comments just show your lack of exposure to what good, prudent and quality leadership can do for a country. Buck Teeth stop being defensive and read again what Moscow OP wrote. Northerners and Easterners feel very unsafe under HH as president. I visualise Bembas being victimised and told they had their chance and now it is time for others. This feeling is genuine among Northerners and Easterners and they will have a bearing on the voting patterns by Northern, Muchinga, Eastern, Luapula and parts of Central province such as serenje and Mkushi. These are facts whether one chooses to be alive to them or just wish them away! Fantastic article well researched indeed. Looking forward to the next one. (1) Load shedding , students can no longer study properly my dear, can you get that? There could be some truth in the article so do not just rubbish it. Why do you think there was so much jubilation at the Heroes Stadium by PF during the Constitutional signing? That was a victory parade for PF. While you UPND are busy insulting and getting distracted by it, PF is doing it maths. The problem with some UPND people is failure to read between the lines and take advice. You do not rubbish anything just because you consider that person to be an outsider. Please learn to learn even from you so called enemies. WE THANK YOU FOR YOUR OPINION AND ANALYSIS ACCORDING TO YOUR PLAN, LET ME COUNT ON WHAT I KNOW AS MUCH AS PF WILL TRY TO PLEASE ZAMBIANS BY HURTING OPPOSITION, PEOPLE HAVE COME TO REALIZE THAT IN THIS 2016 NO VOTE WILL BE DESTROYED BECAUSE THEY HAVE COME FROM VERY FAR. PEOPLE KNOW THE STRONG PARTY AND THE WEAKER PARTY. THEY CAN NOT THROW THEIR VOTE INTO WHAT THEY KNOW IS A LOOSING PARTY. ONLY TWO ARE STRONG AS AT NOW IE, PF AND UPND. OTHER PARTIES WILL BECOME STRONG AFTER ELECTIONS AND TO REMOVE PF IS NOT SOMETHING DIFFICULTY BUT ALL ZAMBIANS HAVE TESTED IT FOR FIVE YEAR AND THEY HAVE MEASURED ITS DIRECTION. PF HAS MASSIVE THUGS, NO DIRECTION TO A FARMER, HAS DONE NOTHING FOR NORTHWESTERN, JOB LOSES, INFLATION, HIGH DEBTS ETC AND THESE WILL COST PF. @SEMEKI,I am not a PF cadre but I like to be fair! MMD was in power for 20 years and the copper boom in NW started under MMD. What great things did MMD do for you but you were voting for MMD and of late UPND! PF came 4 years ago,they are connecting all districts to the national grid ,rehabilitating the Solwezi- Chingola road which they found dilapidated under MMD,gave back Kavindele his licence to construct a railway line which MMD took away from him,are constructing health posts,Schools and a Technical college,are working on connecting the province to Western to shorten distance to Lusaka.. I believe there are more things they are doing.Poverty and unemployment is not only in NW it is the whole country! Let us be fair! Im very concerned at poverty levels in Zambia. What have we done to deserve this, really? But then most people know what the answer is. If this article is going to turn out as the Chitimukulu’s, then I am not interested in the parts to follow. Zambia is currently very divided, there is a lot of distrust and hatred among the people. Furthermore, the Church leaders have not helped at all in uniting the country as they (church leaders) have also taken sides or interested in active politics. Some are now judged by their own sins and running away from their own titles such as “Father”, “Pastor”, “Reverend”, etc and prefer being called Dr or Mr! What falling! If only our leaders would feel the same way as some of us do, and build this country instead of tearing it apart. Mr. Musaluke or whatever you call you call yourself, the message is very clear to all. Try to read today’s Daily Nation/PF paper and see the screaming headlines. Clearly you can see that PF is tearing itself apart. By the time we reach August, we shall just have a shell of the former PF. Viva Miles Sampa. I like this comedy in PF. I need to say it is the regional voting which has mad Zambia such a poor country despite the abundance of resources. Eastern province was once a major producer of food in Zambia including tobacco but what is the situation now? Today some farmers have not received top dressing fertilizer thus,it is up-to Eastern to chose tribe or work with an experienced farmer and business man. You missed the point by saying in 2001 Bembas thought Mwanawasa was a Bemba but in 2006 was lenge but compare the votes of Mwanawasa in 2001 when he was a Bemba and 2006 when he said was a lenge which period did he get more votes? This type of writing will make Zambia become divided.Moreover fish has finished in Mpulungu. Our youths are interested in the current economic issues. Tribe is no longer an issue. They go to same schools, churches and the like. My children speak Nyanja and Bemba. I am happy they have registered in numbers. Whatever the tricks the majority are suffering and change is inevitable. Stop dreaming it is not true that ALL youths in Zambia support UPND. PF equally has a formidable number of youths who believe in its policies. Economic problems are not only in Zambia, this is a global issue currently. The same youths you allude are intelligent and understand this. PF has learned from UPND and will this time apply the Mapatizya formulae too. Watch this space! I keep wondering,which region is upnd,southern,northwestern,barotseland,lusaka,central,copperbelt rural is all one region??? Author could not even explain the graphs in relation to the 50% +1 as expected! Pathetic. Anthony are you all broke that you can be used by PF to write such a shallow article? Come on you are above PF and can do better things in life. The article is pure “fantasy”. The author wishes the outcome could be the way he has projected in the useless article. The facts on the ground are that PF is nowhere near winning the coming election. Let the truth be told. My friend your analysis on 50%+1 is never understood because it comprimises and it shows that u yourself are a tribalistic man.Your article can catch your words that u suport MMD now my friend MMD has vannishd like UNIP for good.Poor understanding of Human Life and its Nature. I think you have underplayed the role Chiluba played in that election. It is amazing how EDUCATED Zambians are still doing the Colonialist white man’s job by segregating the country into tribal blocks. This is not the case at all. A majority of Zambians vote according to the PERSONALITY of the candidate and not according to tribe or even political policies. This FACT has been lost on many analysts of Zambian politics. Kaunda towered in personality above all possible contenders after Kapwepwe was airbrushed out of politics. Then came Chiluba, who had built himself a personality cult through ZCTU. If Arthur Wina had stood against KK in 1991, MMD would have lost. Mwanawasa had a personality of a peanut, but Chiluba backed him against Mazoka in 2001. Banda vs Sata round one was sympathy. The article is good and it has shown the exact picture on the ground. Thanks a lot . Anthony Musaluke………. Thanks very much for your analysis. I did not know that an Engineering graduate from the prestigious Imperial College of Science in the UK could have journalist acumen. I think Form 6 at Mpelembe Secondary School and a sponsorship by the former ZCCM to undertake your undergraduate degree in the UK did the trick. Otherwise all of us from Lubushi Seminary are extremely proud of you. Some people you write hearsay, add some graphics and pass it off as a well researched article. The article is just full of personal opinions, nothing tangible, no real facts. We can all do that but have no time for such drivel. Where does the online media find these characters. All of us express our biases here but why give someone extra space like Anthony has been given. Might as well allow Terrible to do an article as well. No pan intended. This article is tedious. The writer is most certainly on steroids. It can’t be taken seriously because it lacks objectivity even though it seems to be assessing matters across parties. Why oh why would people in the Diaspora be sniggering behind the hands because of Dual nationality. And what has that to do with what he is trying to achieve here in this modern fairy tale UPND tell their children at bedtimes. I am confused, ‘Zambians vote by interest and rarely by issues,’………no no no no writer. UPND say they vote based on their lack of education. Electorate are illiterate and that is why they vote PF and not UPND. The issue of currencies cannot be justifiably used to gain votes because Zambia is not the only country affected by the globally strong performing US dolar. The whole africa is in pain of the powerful US dolar. The issue of droughts also cannot win a person who does not deserve to rule Zambia because as far as people know, the rain season is not controlled by PF. Zambians love peace and cannot afford to vote for selfish/tribal individuals who just want to be in state house without a better plan. Zambians cannot vote for people who call other tribes as devil. Rwanda and Burundi had a bad experience when they voted for a force, tribal leader and that is what every well meaning Zambian is thinking about before voting. There is some truth to the article. Regionalism is deep rooted in our voting patterns. The rest is trash. Your ”15 years…” figure should have shown PF results as PF+ULP (or UPND Sakwiba) since you wrote the UPND results under UDA. Thus you analysis is kind of erroneous or shows a bias for unknown reasons in terms if UPND and PF individual party performances. When it comes to Southern, Western, or North-Western , the votting pattern should be called Tribal, but when it comes to Eastern or Northern, the voting pattern must be described as Interset voting, or at worst Regional! What callous! Whom do you think you are hoodwinkling you biased tribalists! You have it wrong. This tribalism only refer to Southern Province because HH was elected on tribal grounds and you see and learn from the Mapatizya formular and past comments from some Tonga leaders who promoted that only a Tonga should lead UPND. So do not bring Western and Noth Western in this issue. There is no escape. It is very clear that UPND has been declared a Tonga led party. HH has never refused the fact that he made UPND leader because he was Tonga. What is surprising is that other people are trying to defend him when by his silence, HH has admitted because he offers no rebuttal. Good thinking. P.F is winning. It does not need a lengthy article like this for intelligent minds to know that UPND shoot themselves in the foot be fighting for 50+1. There is no way, HH will get any near to 50% of the votes cast. ECL will remain in plot 1 after round one. Due to excessive tribal voting in Southern Province in round one, many voters in other provinces will vote for ECL to show the voters in SP that tribal voting for the sake of it not good. ECL will easily win in the second round. ECL and PF are winning in 2016. This will tell UPND that it wrong for them to allow HH to its President just because he is Tonga.